Dozens of senior Palestinian Authority officials, including Palestinian President Mahmoud Abbas, welcomed senior Fatah official Abu Maher Ghneim to the West Bank city of Ramallah Wednesday, after 40 years in exile in Tunisia. Other senior movement officials, as well as Prime Minister Salam Fayyad, attended the event. Ghneim retuned to Ramallah ahead of the Fatah convention scheduled to take place in Bethlehem on August 4. Abbas called Ghneim's return "another landmark in the Palestinians' fight for liberation and the modernization of the Fatah movement." Ghneim is considered by many as the leading candidate to inherit Abbas as Fatah leader, although he is approaching 70. In the ceremony Ghneim said that, "The Palestinians will eventually fulfill their dreams. Our road will be hard, but victory is near." 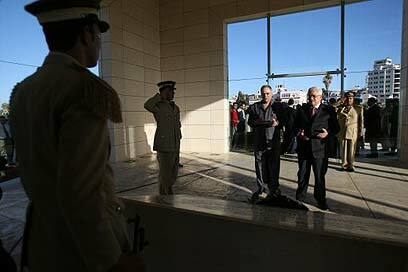 He also laid a wreath on the grave of late Palestinian President Yasser Arafat. In the meantime the Fatah convention continued to be another disputed issue between the movement and Hamas, which threatened not to allow Fatah delegates leave Gaza to attend the Bethlehem event. A Hamas senior official, Dr Sami Abu Zuhri, said Wednesday that the group will use all the means at its disposal to bring to the release of hundreds of Hamas activists jailed in the West Bank. In response President Abbas threatened to arrest other Hamas operatives. Meanwhile, Israeli officials said that Jerusalem will not prevent senior Fatah leaders in Syria and Lebanon from attending the convention. "Israel's policy is not to limit the movement of delegates arriving for the convention," one official said. However, Israel has yet to decide whether it will allow Fatah representatives from Gaza to go to Bethlehem. See all talkbacks "Ramallah: Warm welcome for 'Abbas' heir' "